Many of us are already aware that mosquitoes have the potential to spread diseases in humans. 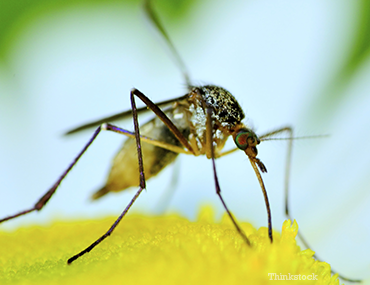 West Nile Virus has received significant attention, and mosquitoes may also carry Eastern Equine Encephalitis. Fortunately, none of these conditions affect dogs very often. Still, dogs are not completely immune to mosquito-borne disease. Heartworm, a very serious condition, is of foremost concern. Heartworm disease is as scary as it sounds. It is a severe and potentially fatal disease caused by parasitic worms that like to live in the heart and the arteries of the lungs of many types of mammals. Heartworms are a type of roundworm and dogs of any age or breed are susceptible to infection. Heartworms are spread by mosquitoes that are infected with immature or “baby” heartworms when they bite an infected dog and ingest its blood. The baby heartworms, called microfilaria, mature into larvae in the mosquito. When the mosquito bites another mammal, like a dog or cat, the larvae are left on the skin and migrate into their new home. They migrate through tissue, under the skin, and eventually enter the blood vessels, where they quickly take a ride to the arteries of the lung. It takes approximately 6 months for infective larvae to grow into mature heartworms and begin procreating. Adult heartworms can live 5—7 years in a dog and, unfortunately, they enjoy living in the pulmonary vessels of the heart, which can wreak excessive damage on a dog’s heart and lungs. While heartworms can infect more than 30 species of animals, such as ferrets, domestic cats, foxes, and other wild animals in the dog family, canines are considered the definitive host for these devastating worms. As the worms mature and mate, they produce microfilaria that are released into the blood stream, picked up by mosquitoes, and spread to other unsuspecting hosts. Canine heartworm infection is found throughout the United States, and infected dogs have been noted in all 50 states. 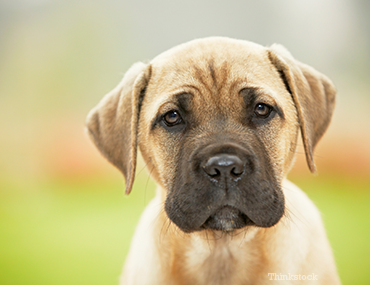 Heartworms aren’t fussy: they like dogs of all ages, shapes, sizes, and breeds. Regardless of where dogs live, they are at risk! The severity of the infection depends on many factors including the number of mature worms, the length of the infection, and a dog’s activity level. Heartworm disease can cause a variety of medical problems and affect the lungs, heart, liver, and kidneys. In the early stages of infection, a dog may show no signs of infection at all! As the infection progresses and the number of worms increases, symptoms can become more apparent. A diagnosis of heartworm disease is dependent upon having an accurate history of the dog’s whereabouts and lifestyle, and her symptoms. Your veterinarian will perform a thorough physical exam, and may recommend diagnostic tests to determine if your dog is infected. The good news is that, in many situations, dogs infected with heartworm disease can be successfully treated. Treatment kills the adult worms present; its success is dependent on the health of the dog and the severity of the infection. The most important part of treating a dog with an adult heartworm infection is to minimize the harmful effects of the drugs and reduce any complications produced by the dying heartworms. Your veterinarian will work very closely with you to determine the best treatment for your dog and how to reduce any risks or complications. The best news about heartworm disease is that it’s easily preventable! Preventive medications to combat heartworm disease are often provided in the form of a monthly chewable tablet, or a topical medication. Be sure to discuss your dog’s risk with your veterinarian to determine the best preventive for your furry friend. It is recommended your dog be tested annually for heartworm disease—even if she is on a preventive—to ensure that she is not infected. Not all preventives are 100% effective, and many of the tests available today have the additional benefit of detecting other infections, such as Lyme disease, with one blood sample.